After the big hoo-haa of its introduction last autumn very little has been heard of the Microdrive and its ZX interface 1. Either the Spectrum owners who have ordered this unit are waiting in stoic silence for the ‘high-speed’ random access (or random delivery?) unit to drop through the letterbox or they already are in possession of the very same and are treating it with the same interest and enthusiasm befitting the old and dusty ZX81 hanging above the fireplace. Having just received by miracle a rare species by the name of Microdrive on loan from the very source and creator of ZX wonders (to be returned within two weeks — could this really be the one and only working unit on its Ulyssean travels to far and distant magazines?) CRASH has the opportunity to discover the untapped resources contained within the Microdrive and the ZX interface 1 and with luck avoid the temptation of launching the first Microdrive User supplement (what an original idea!). At first the main function of the ZX interface 1 becomes obvious: this unit provides the roué games player with a wonderfully tilted keyboard position and allows a far superior keyboard control for those multi-digit arcade games. But what of the side-effects? Well, three cannily hidden benefits have been spotted and will be discussed in detail. Keen programmers appreciate LOAD and SAVE wait times as being the most creative pauses in the programming process, but many games players could do without this boring interlude. The Spectrum may have improved loading times by a factor of four over the ZX81 but this is annihilated by the vast memory size of the 48K Spectrum. The Microdrive sounds like the remedy to this problem. Just download your cassette-based games software into the Microdrive cartridge and you have instant access to your games library. But wait, this proves to be a nightmare. The games software consists of pure machine code in 95% of cases and once loaded it is practically impossible to return to Spectrum BASIC for the Microdrive save commands. The idea proves to be impossible unless you are a whizz kid and can interrupt and disassemble the game’s machine code, locate the start position in memory and download the dissected code into Microdrive data files. You will then still have problems with autostart and possibly you may even have to relocate code which may have been originally in the Microdrive systems variable and MAPs area of the memory. Obviously the Microdrive is not the solution to this problem. There is however another advantage. The cartridge tape contains a minimum of 85K bytes and whizzes round in less than eight seconds. Given the fact that the operating system has to locate the file to be loaded, the average access time may vary from one to eight seconds depending on the position and length of the file on tape. Compared to an average load time of four minutes for a 25K games program on cassette, the Microdrive constitutes a 30-fold reduction of wait time and you can wave goodbye to the usual tea-break at this point. 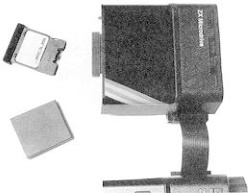 The Microdrive is a random access storage system — forget about rewinding and locating program starts. The cartridge contains an endless loop of tape and the operating system, which is an extension of the Sinclair BASIC, will control the Microdrive and will guarantee a complete revolution of the cartridge tape for every access. During this revolution it will look for the file selected or for the clear tape area required for the load or save function and perform the LOAD or SAVE automatically. Once completed, it will have positioned the tape ready for the next access. The principle with which this can be achieved is similar to the exciting paperback adventure The Warlock of Firetop Mountain from Penguin. Your choice of action will dictate which page number you will have to continue on and similarly the same applies with the Microdrive. Substitute the page number with data files and depending on your action in combination with various other conditions, such as objects carried, energy level, past history, etc. the program will load the appropriate data files, which can contain new locations, new characters or new conditions. If the idea of such a mammoth adventure scares you, just think of the poor programmer, who is now faced with the agony of writing machine code programs in excess of 100Kbytes. No doubt adventure games writers are at this very moment labouring away frantically at their first microdrive epics and we will see some results in the near future. The key to a successful approach will not only lie in the quantity of locations, but in the intricacy of the path of actions and events which should hide the in-built linearity and limitation of access to the various data bases. In other words, the epic should not result in a series of self-contained subadventures, but should appear as a smoothly flowing saga. A great many people consider the computer to be a deadly social enemy which can turn the entire population into bleary-eyed non-communicating morons living within the confines of their own computer system. A network system goes a long way towards bringing people back to contact with each other by allowing one anti-social computer user to communicate with another. It helps them to play friendly chess matches over long distance without coming to blows with each other or to play ‘Battleships’ without being able to peek at the opponent’s secret ship positions. It also allows the sharing of expensive data bases and up-to-date news items. The ZX Interface 1 in conjunction with the extended BASIC sets up a local area network, and by local this really means a user-group within the confines of a room. Now obviously this limits the range of applications. Chess and other board games may well be played in their original version without the computer at this close range: you would hardly think of communicating with another person in the same room via telephone when the person can be approached directly. Another communications option is the serial interface RS232. This proves useful for connecting up peripherals such as printers, plotters and modems. If your Sinclair printer has developed dyslexia and prints out garbled and random pixel messages, doesn’t feed the paper and saves paper cost by printing listings all on the same line, then you might consider upgrading your print-outs by purchasing an inexpensive dot matrix or letter quality daisywheel printer. The interface provides two channels. The text channel ‘t’ is used to send the text or listing to the printer. The binary channel ‘b’ will transmit binary control codes to the printer for double width, double strike, condensed italic printing, etc. Any standard baud rate between 50 and 19,200 may be set up, so this should accommodate any peripheral. A V21 modem may be connected up to the serial interface and access gained to remote computer owners via normal telephone lines. The modem converts the serial data stream into a phone line compatible frequency shift signal. An audio coupler may be used so that the transmission can occur through the speaker and mouthpiece of a conventional phone. The Spectrum can also be hooked up to another computer with a serial interface. A good knowledge of both systems and necessary protocols is required. Certainly the most exciting aspect of the ZX interface 1 is the cheap and fast microdrive storage systems, which opens up a whole new world of adventure and possibly arcade games. It will be interesting to see what price level will be set for Microdrive cartridge software.